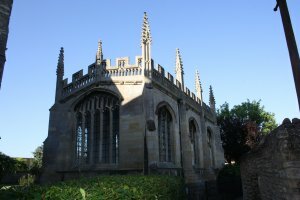 The Parish Church of the Blessed Virgin Mary with its' magnificent spire at 170 feet set in the churchyard with the Bede House and the Chantry Chapel (former Grammar School) close by is an architectural gem. There appears to be no trace of any former Saxon church, although there is a strong possibility that there was one, and the present church appears to date from around the time of the granting of the Charter in 1251. The West front contains a recessed porch of particular interest as the 13th century sculpture has survived almost intact. Around each of the twin doorways are carved Old Testament characters of David's line which found fulfillment with the birth of Christ, who forms the centrepiece in his mother's arms. The roundels in the arch contain scenes from the life of Christ. The spire and part of the tower collapsed in 1630 but were reconstructed immediately with the original stone and a crocheted spire, and a tablet high up on the West side of the tower commemorates this. The spire was extensively renovated and restored again in 2006. The interior groundplan of the church is unusual with its' wide nave with three rows of arches making a complete square, with the earliest work being the Southern arcade being early English. About 100 years later the church was enlarged to the North with two further arcades in the Decorated style. At that time the roof level was altered and the clerestory and present roof added together with tracery to the windows. A very thorough but sympathetic restoration took place in the 1850's with the South aisle being rebuilt with the original roof timbers being retained. The Rood with its' loft was installed in 1920 and is the work of Sir Ninian Comper. The Choir has a complete set of twenty stalls with carved misericord seats, the collegiate arrangement for the Clerks and Priests of the College founded by Henry Chichele. The high Altar steps still contain the 14th century encaustic tiles which survived the 19th century restoration, and the Font is 13th century. The screens and stalls are from the 15th century. There are noteworthy brasses especially that of Laurence Seymour under the highly decorated arch separating the High Altar and the Lady Chapel. The brass is from 1377 and is of the last parish Rector before the great Tithe was taken to form the foundation of a college in Leicester. A number of Chichele family brasses exist in the Lady Chapel.